Federal government employees have been directed to refer to irregular maritime arrivals as ‘illegal’, flying in the face of international conventions and practices. Australia’s recently elected federal Immigration Minister, Scott Morrison, has reportedly ordered his departmental staff to refer to asylum seekers coming by boat as “illegal” arrivals. Our nation is a signatory to a multilateral treaty – the United Nations Convention Relating to the Status of Refugees – that gives citizens of every country the right to seek refuge or asylum in a country other than their own if they have reasonable cause to fear for their wellbeing. If you read even a brief synopsis of that treaty, you will see that our nation has already stretched the interpretation of – if not breached – a number of its responsibilities. For one, this convention specifies that no person rightfully seeking refuge shall be considered to have entered a country illegally, regardless of whether they are carrying identification papers. And – as those who object to our nation “opening its doors” to those arriving by boat seem to overlook – Australia is an affluent nation by any standard yet, in reality, we take but a tiny percentage (0.30 per cent a year) of the world’s 45.2 million forcibly displaced people. This is a global issue and we are not lifting our weight in that regard and, as a consequence, our reputation internationally is tarnished by our recalcitrance. 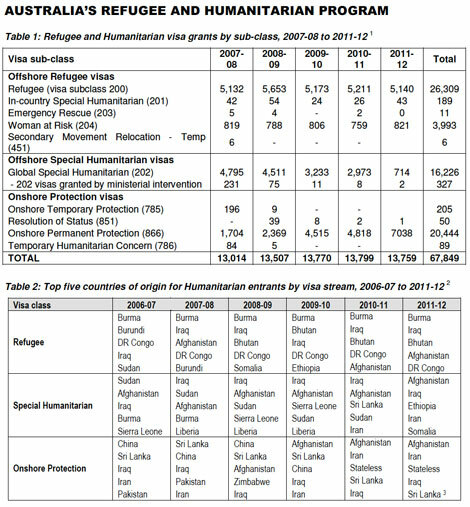 Ample and telling statistics on irregular maritime arrivals are readily available on the Refugee Council’s website, including how we stack up against other nations in terms of accepting refugees. Those who, like our Immigration Minister, seek to paint all irregular maritime arrivals as illegal are morally wrong to do so. 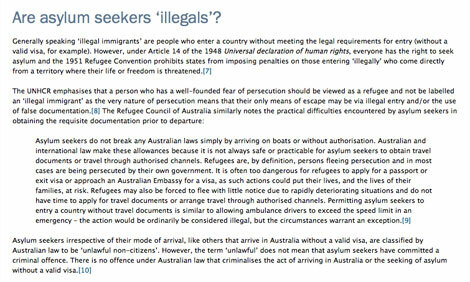 These people are not entering Australia illegally unless they are not genuine refugees and that takes time to establish. How the Federal Government differs from what the Immigration Minister says. 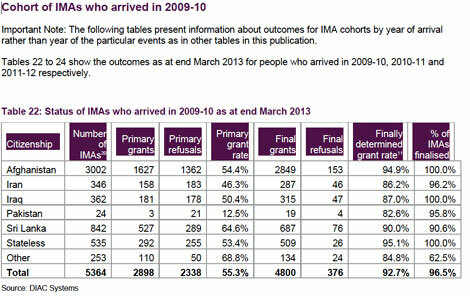 The vast majority of irregular maritime arrivals on Australia’s shores have subsequently been proven to be genuine refugees, as the three tables below from the Immigration Department’s own March Quarter 2013 Asylum Statistics report confirm, with the percentage of irregular maritime arrivals found to be genuine refugees listed in the second last column of each table. 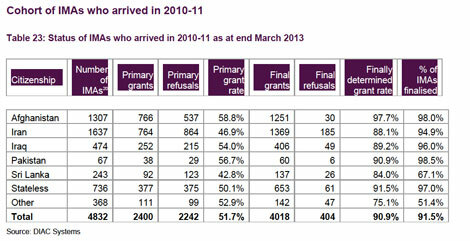 Source: Australia’s Immigration Department March Quarter 2013 Asylum Statistics report. So, until their status is established, these people are properly referred to as irregular arrivals or overstayers (for those who fly in on a visa and fail to leave). Australia’s habit of casually, and thoughtlessly, branding irregular maritime arrivals as “boat people”, “illegal entrants” or simply “illegals” is being egged on by largely conservative voices in its mainstream media. However such partisan semantics do not sit well against the terms typically used in other countries for such activity, where many nations are accepting far greater numbers of displaced people each year. Global media coverage following recent tragedies off Italy illustrate the vast difference between the way we see the issue reported here in Australia and the way most leading European and even US media depict those fleeing persecution: They simply describe them as ‘migrants’. However, with insidious influences not respecting international borders, note the tone of the (conservative UK news organisation) Daily Mail’s alternative depiction of these migrants as “illegal immigrants”. Regrettably, an Australian national news service opted for the politicised rhetoric by recasting its headline on that story to accommodate local political sensibilities. And our national newspaper, The Australian, decided to tow a similarly conservative line. Interestingly, as Italy demands action on the “migrant crisis” at an EU summit later this week, the Chicago Tribune online notes that the Italians’ reasoning centres principally around saving lives and preventing further needless drownings at sea – with 20,000 plus dying this way over the past decade in Mediterranean waters – above even concerns about social and economic consequences that a large influx of African migrants will have for an already seriously strained economy. 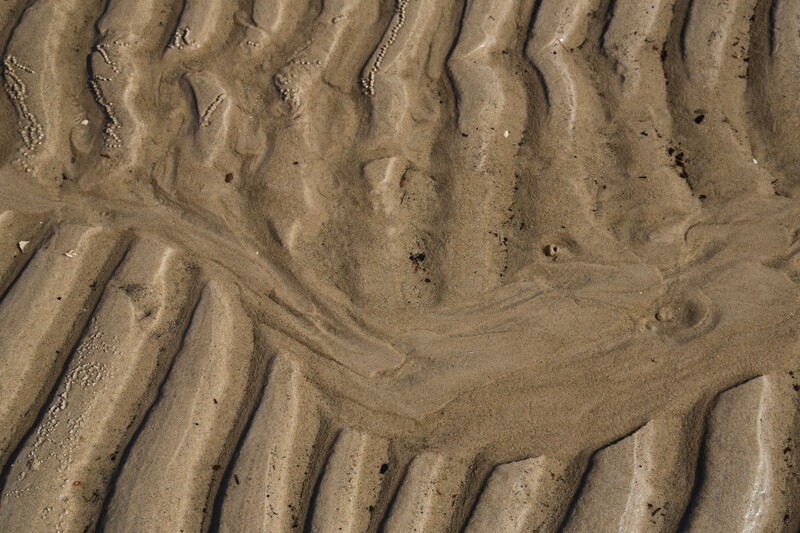 Here – in one of the globe’s most stable economies, where we actually have relatively few irregular maritime arrivals despite all the hoop-la – the motives of politicians, including Morrison, who condone the demonisation of these human beings by their words and actions should be exposed to far greater scrutiny. These politicians, and all of their media apologists, are misleading their constituents in dangerous and divisive ways. They are fuelling social discord, ostracising those who deserve our assistance and giving their blessing to a form of ill-informed discrimination that is unholy, unhealthy and unjust. The issue of dealing with the growing number of displaced persons is a global one. All nations need to pitch in to address the conundrum. Ours is – and has been for many decades – a multicultural nation that has welcomed people from every corner of the globe, many of whom fled areas that were troubled or they themselves were under duress. Hundreds of thousands, perhaps millions, of those newcomers have gone on to become significant contributors to the strength, diversity and culture of today’s Australia, so they could hardly be considered welchers. Many arrived by boat and, at that time, with the blessing of the Australian Parliament and its people whether they had their passport or not. in one of the globe’s most stable economies, where we actually have relatively few irregular maritime arrivals despite all the hoop-la – the motives of politicians, including Morrison, who condone the demonisation of these human beings by their words and actions should be exposed to far greater scrutiny. Slowing today’s spiralling growth of those needing refuge is one of the key reasons why being a member of the UN Security Council is important for a nation of our size, even if it’s only a two-year stint for now. Any steps the global community can take, in unison, to diminish state-sponsored, ethnic or religious violence towards citizens in troubled countries will serve to help staunch the growth of ‘forced’ migration. In the meantime, Australia – as an island with no land borders with other countries – in reality does not have to contend with millions flooding over its borders as other nations do. To not help resettle at least our share of legitimate refugees will only allow the perpetuation of the sorts of human rights abuses that have, in the past, led to genocide and sparked world wars. We are, whether we like it or not, exposed to a global phenomenon when it comes to resettling human beings seeking to live in a safer nation. We have a responsibility to be strong enough to be part of the solution rather than part of the larger problem.